The combination of ginger and jaggery is sensational. Comforting and yet sophisticated this smooth creamy gelato was a result of several failed experiments. I tried a couple of recipes and found that adding ginger, dried or fresh split my milk when I was boiling it for the custard. So I prepared a ginger jaggery syrup instead and added it chilled to my custard. The proportion of the ginger jaggery syrup is important because too much liquid with make your gelato icy. Boil the ginger and water together until you have about half the volume. Add the jaggery and cook until its fully melted and you have about 3/4 thick liquid left. The liquid should not caramelize so keep the flame low. The color of the liquid should be similar to golden honey. Try not to stir the syrup but just swill the pan about. Pass the hot liquid through a fine sieve to get any fibers and pieces of crystallized sugar out. Cover and chill. Heat the milk and vanilla in a double boiler until it begins to boil. Switch off flame. Whisk egg yolks in a mixing bowl. Add 2 tablespoons of the hot cream to the egg yolks and whisk immediately to temper the eggs. Add the rest of the hot cream and whisk briskly then return mixture to the double boiler on a low flame and keep whisking. This takes patience but custards can curdle very easily if the flame it to high or you stop whisking. Cook on a slow flame until you have a thick but smooth custard. Do not overcook it or it will split. Switch off the flame and stir in the chilled ginger jaggery syrup and incorporate well. Strain through a fine sieve to remove any eggy bits. Pour into a pre-chilled ice cream maker and process according to instructions. Mine took about 25 minutes of churning. 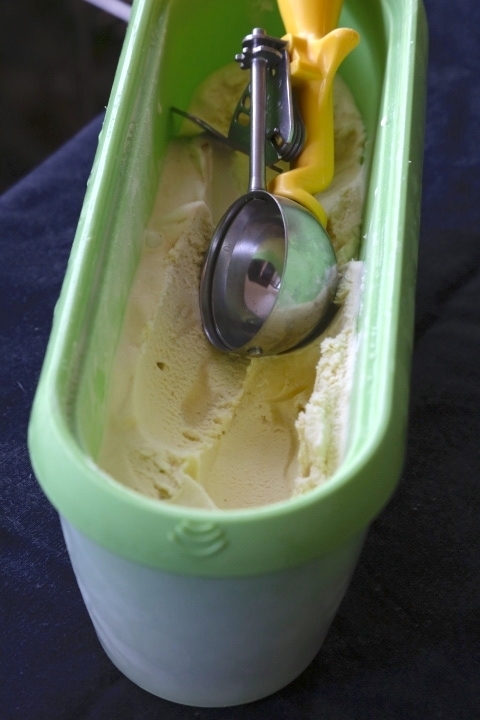 Remove gelato and scoop into an ice cream box and freeze until ready to use. Hi. I don’t have an ice cream maker. 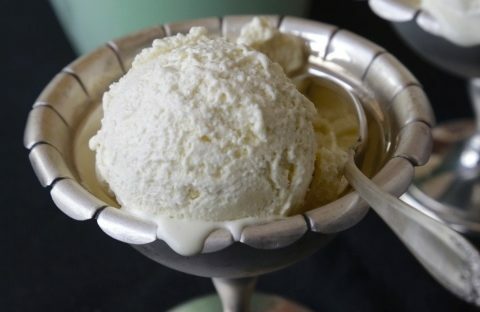 Is there any alternate way in which i can make this ice-cream? Thanks. YOU CAN HAND CHURN THE ICE CREAM LIKE THEY DID IN THE GOOD OLD DAYS. FREEZE A THICK WALLED CONTAINER IN THE FREEZER. POUR IN THE CUSTARD, PLACE IT IN A LARGER BOWL OF ICE AND KEEP CHURNING- IF YOU HAVE AN ELECTRIC HAND WHISK USE THE PADDLE ATTACHMENT. OPTIONALLY DON’T CHURN AT ALL, JUST FREEZE IN AN AIRTIGHT CONTAINER. YOU WILL STILL GET A PRETTY GOOD ICE CREAM.